This was a big year for the Korean-born American actor. This summer, Cho starred as Sulu in “Star Trek.” The film went on to gross $257,730,019 making it the sixth highest-grossing film of the year. Following Star Trek, Cho moved to the small screen in “FlashForward,” ABC’s sci-fi drama. “FlashForward” has been renewed for a full season and Cho will continue to co-star in the series. Thanks to two very successful projects, Cho was also named one of People Magazine’s sexiest men alive. This happened a couple months after I lamented about the lack of male Asian celebrities considered attractive by the public. This was John Cho’s year and here’s toasting to more. Eight Academy Awards later (including best picture and best director), “Slumdog Millionaire” was officially the underdog that pulled off the upsets. The film told the story of an Indian teenager winning a game show and starred a number of Indian actors including British Indian actor Dev Patel and Indian model and actress Freida Pinto. Both actors have a number of projects planned for 2010 and beyond. What an exciting win for a film set within an Asian culture! Six seasons in and “The Office” is still going strong. This year marked the highly anticipated wedding of characters Pam and Jim. Producer and co-star Mindy Kaling played a role in making that happen. Kaling was nominated for an Emmy for her work on the show this year and is up for a Screen Actor’s Guild’s award next year as well. I predict that Kaling will be on the list when the Emmy 2010 nominations are announced! A few years ago, no one knew who Jason Wu was. After all, at the age of 27, the Taipei-born designer was still relatively young for a fashion designer. In November 2008, future First Lady Michelle Obama wore Wu’s dress on “Barbara Walters Special.” The Wall Street Journal cited this as his “career launcher.” After Obama wore his white asymmetrical gown for the inauguration ball, a star was born. Since then, Wu has shown two collections at New York Fashion Week and is on the fashion world’s radar as a rising star. You may not know Jay Sean’s name, but you definitely know his song “Down.” After years of success in his native UK, Eastern Europe, and Asia, the British Indian musician made history this year as the solo Asian artist to have a No. 1 song in the United States. Music has been a field that Asians have been slow to move into, and it’s exciting to have Sean on the scene. I know, I know. I’ve been complaining about the train wreck that is Jon Gosselin for months, but what else can I say? The man neglected his eight children to party with Michael Lohan and Christian Audigeer, dated his wife’s plastic surgeon’s daughter and a tabloid reporter, and then was sued by TLC and called “embarrassing” by the network. As of December, Jon and Kate’s divorced was finalized and his lawsuit has not concluded. For his children’s sake, I hope the man disappears from the tabloids next year. I would argue that Jon Gosselin and Tiger Woods just might be the two most embarrassing characters in 2009 pop culture period, not just as Asian celebrities. Earlier in the year, Woods is a man that I would have called a winner. He had a beautiful wife and family, was the face of a popular sport, and had millions in the bank. After about a dozen infidelities with cocktail waitresses, club promoters, and strippers were revealed, that was over. On Dec. 11, Woods announced he was taking an indefinite hiatus from professional golf to focus on his family and marriage. Within days, Gillette and Accenture dropped and halted endorsement deals. His wife Elin Nordegren was seen recently without her wedding ring. Talk about celebrity scandal of the year. A pet peeve of mine is those who seek attention, and Richard and Mayumi Heene (of Japanese ancestry) are just that. In October, the world watched as officials chased a hot air balloon that the Heenes claimed their son, Falcon, was on. It turned out that there was no boy in the air balloon. After Richard Heene appeared on “Larry King Live,” Falcon revealed the incident was fabricated for publicity. On Nov. 13, Richard Heene pleaded guilty on a number of felony charges. 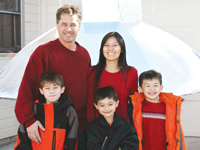 On Dec. 23, Richard and Mayumi were sentenced to 90 and 60 days of jail time, respectively. Seriously, was it all worth it? Speaking of desperate, this Vietnamese American reality star faked a pregnancy and failed to convince a San Diego judge to buy her accusations against ex-boyfriend Shawne Merriman, who allegedly choked her. On Dec. 20, she announced that she was pregnant again as a surrogate for her brother. Stop. No one believes you or cares. I hate to put Lindsay Price on the list because I think she is very cute, but alas, television viewers do not agree with me. Price started the year with her show “Lipstick Jungle” being cancelled, but was then immediately linked to the new show “Eastwick.” A few episodes in and that too was cancelled. Eastwick marks Price’s fourth cancelled show. Her last successful show was “Beverly Hills 90210” … about 10 years ago. Hereis a method to access BBC Iplayer readily from america by with a British ip-address and concealing your true location. It’s quick and simple to use and presented truly working in this video. I want Darnell to win, I’m not sure who I think will win. i just know jay sean, tiger woods.. who are the others..lmao!! never heard of them..